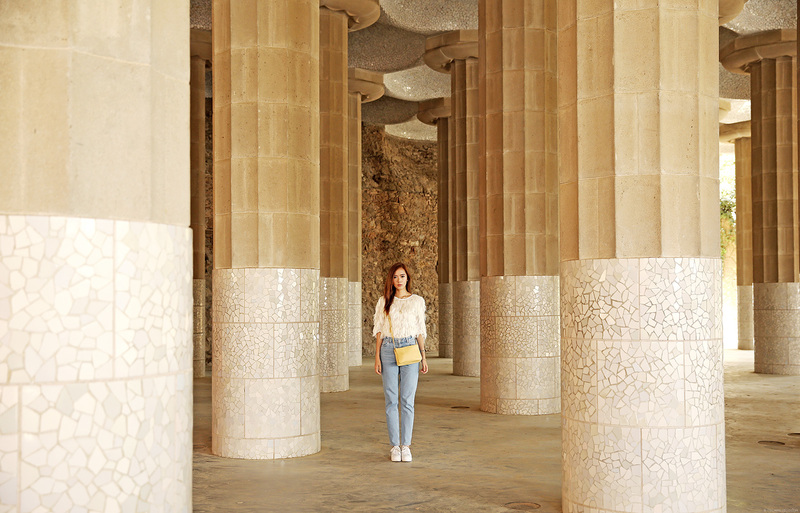 Deciding where to shoot my outfit photos in Park Güell is no easy task. As you’ve seen in my previous post about this place, it is just full of editorial-worthy spots! This area I chose to shoot in is called the Hypostyle Room or the Sala Hipóstila, a covered area with 86 striated columns. I thought the colors here looked great with my casual outfit–nothing too distracting so that all of you can focus on how pretty this hairy fringe sweater is. At first glance, it looks like one hot sweater, literally. But in reality, it’s only hot figuratively. The sweater is actually a mesh knit so it’s not as thick as it looks. Perfect for a breezy day in Barcelona! Hi Camille! I really really love it whenever you’re wearing my favourite color skyblue and more than that you rock that mom jeans. Hope I can pull off that style too. Do you think it will go well with a medium-sized thigh like mine?? Haha. I admire you always for being genuine in your style! My hips are actually quite curvy so I think it won’t be a problem for you as long as your waist is emphasized. Look at Queen Bey! You look so pretty, Camille!